Are you a Nafzinger or a descendant of the Nafzinger family? I’m happy to share and could use some help with the genealogy work I’ve started. If you’re family, whether immediate or distant, please say hello or leave a comment below. I am grateful for the opportunity to connect! My mother and I stumbled across your website when searching for Nafzinger on the internet. My mothers mother was named Martha Nafzinger her parents were Emma and Moses Nafzinger. Moses ? parents were Peter & ? Nafzinger They lived on a farm in Long Green, Md. Peter was born in Germany. My mother actually has a copy a book which has all the history of all the Nafzingers. Love your site. Have a great day! Good to hear from you. I’m very sorry for the delay. We visited the farm and a cemetary in Long Green, Maryland with my grandparents, John R. and Ruth Nafzinger, about 15 years ago. Sorry, I just noticed your response. Thanks for replying to me. Cool pics; I will pass these on to my mother. My parents actually live 5 minutes from Long Green and They and myself are members of the Long Green Valley Church of the Brethren. This is the cemetery right up the street from our church. I have visited it myself. It is on Kanes Rd. I know a John Nafzinger whom I have always referred to as Uncle John. I last saw him at Ida Mae Tombaugh’s funeral at our church. Is that your grandfather? Glad to see the photos of the Long Green Cemetery. I made and painted the sign at the cemetery. The last time there it looked like it needed rebuilding and repainting again. I have researched all the families burried in the cemetery except for several un-marked graves. Pass the word along to come to the annual meeting of the descendents of the Long Green Amish Mennonite community including descendents of Peter Nafzinger on September 10, 2011 starting at 10 a.m. at the Long Green Valley Church of the Brethren. Some of my Mast ancestors are buried in the Long Green cemetery. I can be there on September 10th and give a ride to Clyde. I now live in York Pa and pastor Covenant Moravian Church. 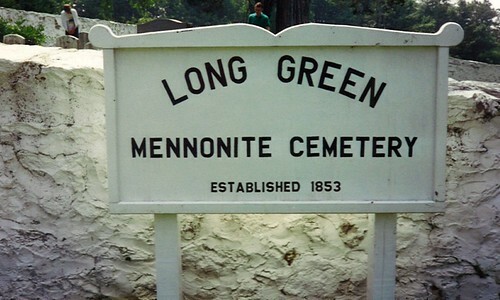 How is the Long Green Mennonite Cemetery related to Maple Grove Mennonite Church of Atglen, PA. There are records in the past that our church managed the funds for the cemetery at one point. The fund still exists. Any help you have will be appreciated. Church phone: 610-593-6658. Leave a message and I’ll call you back. Vernon Kennel of Atglen PA was Treasurer for quite a while of the Long Green Cemetery. I believe he was a member of the Maple Grove Church and was probably handling the funds for the church. The fund still exists and is now managed by the Mennonite Church at Newport News Virginia with an active committee taking care of the funds, the maintenance of the cemetery and the Annual Long Green Meeting. I believe the meeting this year 2012 will be on September 8 starting at 10 a.m. at the Long Green Valley Church of the Brethren just a short distance from the cemetery. You wold be welcome to attend. It’s great to hear from you! It sounds like you’ve done far more research than I have. I’d be thrilled to look at your work sometime. As I get older, I’m becoming more interested in researching and archiving these details for future generations. I’ll check my calendar to see if I can make the annual meeting in September. Once again, thanks for sharing and keep in touch. My great grandfather,Isaac D. Hertzler married Fannie Nafzinger daughter of Peter and Lydia Yoder Nafzinger . Fannie was the oldest of five children. She was born Aug.14,1855[stone says Aug.18. She died June 23,1936.She was buried At Warick River Mennonite Church cemetery, Denbigh, Va. My wife is in a Rehab hospital in Richmond, Va. One of her therapist is Lauren Nofzinger. I think I frightened her when I told her we might be related. Her grandfather was Donald. Lived in Ohio Ibelieve. So I’ve digging a little bit. Ring a bell with anyone? Hi: Iam looking for family of Edward Joseph Nafzinger married to Vena Tinny Wright. Thay left Langenburg Sask Canada in 1921, moved to California. Thay had 3 children. EJ., as he was called sold, land coffins and pianos when in Langenburg and sold my Great Grandfather land about 1903 . I also have a old photo of him in his office here in town. Looking for any information that would enable me to get in touch with one of his children would be greatly appreciated. Have you tried internet searches for Edward? Here are a few. Ancestry.com is probably your best bet. I had a subscription for a short time and was impressed at how much data they had. If I turn up anything else, I’ll let you know. Hey! 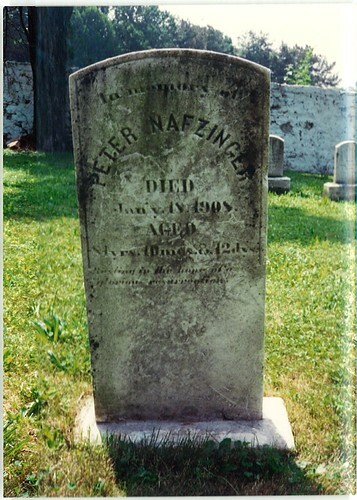 I am a descendent of Peter Nafzinger (Noffsinger, Nofsinger, Nafzger) I am not sure if this is the same family but Peter came to the U.S. with his brother Mathias and Rudolph in 1749. I am just looking for some history and some stories. Let me know if I have the right family! Thanks! I found this website recently since I’m trying to figure out my family history. 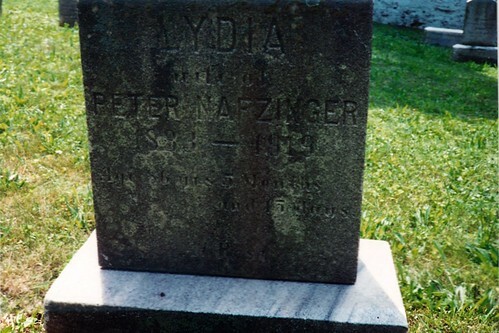 Peter Nafzinger (1826-1908) is my great great great great grandfather. I have found lot of history on the Nafzingers, Mast and Yoders! I live near Long Green, so I have visited the cemeteries and farms around there. I am trying to find other descendants so we can compare findings! Have you ever attended the annual Long Green meeting at the Church of the Brethren? Be glad to meet you and learn your connections to the Nafzingers. Could you please contact me via my e-mail (jeff@coppages.com)? I am a Mast descendant from Long Green Valley living in York Pa. I’d love to compare notes. Thank you. I’d love to compare notes and visit the farms that you mention. I am a Mast descendant living in York Pa. My e-mail is jeff@coppages.com. Thanks.